Composer Robert Kyr embraces peace, love, and nature. Before writing anything down, Robert Kyr composes his works—music and text—“internally,” he says, from start to finish. Or maybe here is the place to begin: with Kyr at the piano. He’d been banging on the keys since he was two or three, and began taking lessons—and composing songs—at 10. At age 11, he started playing pieces from Notebook for Anna Magdalena Bach, a collection of music that the Baroque master wrote for his wife. “The first time I heard Bach was through playing those little pieces and his 15 two-part inventions,” Kyr says. “I kept returning to them again and again because they spoke to me in a way that no other music ever had.” Or ever would. Now 64 and a professor of composition and theory at the University of Oregon, Kyr is one of the most prolific composers of his generation. Some days he spends as many as 14 hours composing (it helps that he sleeps only four hours a night). 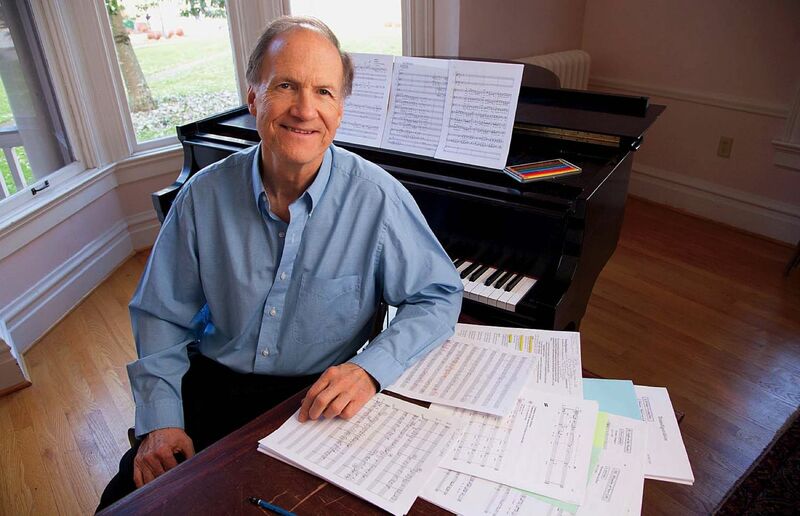 He’s written 12 symphonies, three chamber symphonies, three violin concerti, a piano concerto, and too many choral works to count: cantatas, oratorios, a passion. Patient, tender, emotionally complex, and easily approachable, his music draws on Western medieval, Renaissance, and Baroque styles—Bach is his lodestar—as well as Eastern traditions, especially the Balinese gamelan. His oeuvre orbits broad themes planted deep since childhood: peacemaking, environmental concerns, love, compassion, forgiveness. That long-ago conversation with his mother influenced his 2012 work “The Unutterable,” which featured a narration of Paul Celan’s poem “Death Fugue” as part of a three-month Holocaust remembrance project in Austin. Elsewhere, he has integrated testimony from witnesses and survivors of violence: the 2005 symphony “Ah Nagasaki: Ashes into Light,” sung in both Japanese and English, commemorated the sixtieth anniversary of the atomic bombing with performances in Nagasaki and its American sister city, St. Paul. More recently, “Waging Peace,” a five-movement work, emerged from 400 pages of written accounts by residents of Baton Rouge, a city torn by crime and conflict. Kyr’s home in Eugene sits 1,000 feet up from the valley floor, surrounded by 70-foot trees. Deer roam the yard and hawks fly overhead. “I live in a forest,” he says. “When I look out the window, I don’t see neighbors. The architecture of the Pacific Northwest is trees.” Many of his works celebrate nature and call for its preservation. For his 2007 oratorio, “A Time For Life,” he wrote a choral text weaving Native American prayers, songs, and chants with Eastern Orthodox hymns and Old Testament verses; the symphony “Yosemite: Journey into Light” combined photographs and video of the national park with Kyr’s music. As much as anything else, Kyr’s work is guided by spiritual exploration. His family didn’t attend church—his father was raised Catholic, his mother Lutheran—but when his parents died in 1981, he found himself exploring religions from around the world. “I discovered that I’m interfaith,” he says. “I celebrate with people of all faith backgrounds.” Since 1993 he has spent about eight weeks each year at Christ in the Desert Monastery, a Benedictine abbey in the gorgeous and remote wilderness of a New Mexico mesa canyon: “My spiritual home.” During solitary hikes along the Chama River, he composes music “internally” and then returns to the monastery to write deep into the night. There he created one of his most spiritually searching works, “Songs of the Soul,” a 47-minute cantata venerating and responding to music by Bach and three Renaissance composers. Its companion cantata, recorded by the Grammy-winning vocal ensemble Conspirare, is “The Cloud of Unknowing,” which takes its title and part of its text from a fourteenth-century guide to contemplative prayer. This past year, he helped launch the Harvard Choruses New Music Initiative, a program for undergraduates. He mentored seven students through a seven-month process that ended with a performance of their finished musical works by a professional chorus, the Antioch Chamber Ensemble. (He is mentoring a new group this spring.) He also led a workshop for Radcliffe Choral Society and Harvard-Radcliffe Collegium Musicum members that culminated with the creation of “In the Name of Music,” which was premiered in November at Sanders Theatre. “I wanted to engage the singers in the process of writing the text, so that they would ultimately be singing about a theme that deeply concerns them,” Kyr says. When he asked them what issues concerned them most, their answers had a common thread: the transformative power of music.